Intrathoracic lymphadenopathy is a common problem encountered in pulmonary medicine. A wide range of diseases can present with intrathoracic lymphadenopathy including malignant (lung cancer, lymphoma, and others) and benign disorders (tuberculosis, sarcoidosis, and others). A definite diagnosis is thus crucial in the management of these disorders. Several techniques are available for sampling the enlarged mediastinal lymph nodes, including mediastinoscopy, thoracotomy [open or video-assisted thoracoscopic surgery (VATS)], computed tomography (CT)-guided transthoracic sampling, conventional transbronchial needle aspiration (TBNA), and recently endobronchial ultrasound (EBUS)-guided TBNA. Invasive surgical procedures such as mediastinoscopy are considered the reference standard in evaluating intrathoracic lymphadenopathy (especially in lung cancer staging)., However, mediastinoscopy is not only invasive, expensive, and requires considerable expertise, but it is also associated with significant morbidity and mortality. CT-guided transthoracic sampling of mediastinal and hilar nodes is a less invasive alternative, but the rates of pneumothorax are unacceptably high (up to 48%). 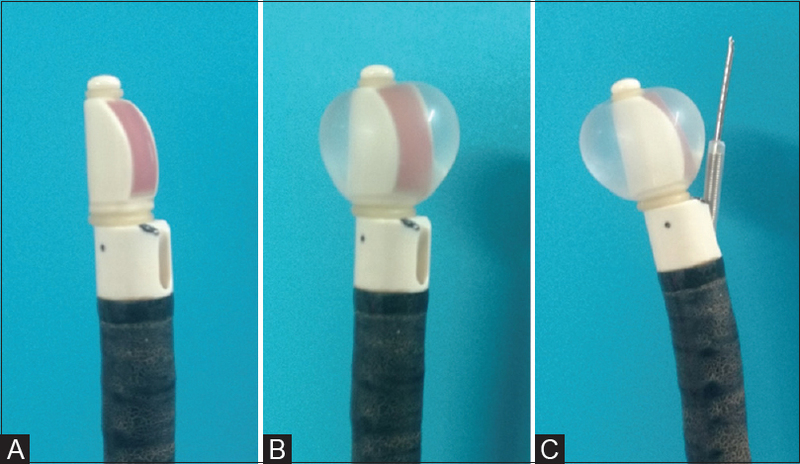 The introduction of TBNA using flexible bronchoscope provided a minimally invasive alternative to surgical sampling of intrathoracic nodes with a reduced incidence of complications. However, the sensitivity of this conventional or “blind” (unguided) TBNA procedure is low, operator dependent, and varies with the location and size of the mediastinal lymph node., In fact, the variable and poor yield of conventional TBNA has discouraged pulmonary physicians from practicing it widely. The advent of EBUS has enabled sampling of intrathoracic nodes under real-time vision. EBUS-TBNA is a safe and minimally invasive procedure and is currently the preferred procedure in the evaluation of undiagnosed mediastinal adenopathy and staging of lung cancer.,,,,, Herein, we discuss the techniques involved in performing a successful EBUS-TBNA and the challenges faced. What are the instruments used for the EBUS-TBNA procedure? What are the indications and contraindications of EBUS-TBNA? The most common indications include the diagnosis and staging of lung cancer, and evaluation of undiagnosed intrathoracic lymphadenopathy.,, In addition, lung and mediastinal masses adjacent to the larger airways are also accessible to sampling by EBUS-TBNA. Uncommonly, EBUS has also been used to sample left adrenal gland. Rarely, pulmonary embolism (thromboembolic as well as tumor) may be diagnosed incidentally, while performing EBUS., EBUS has also been employed for fiducial placement and transbronchial needle injection of chemotherapeutic or photodynamic therapeutic agents to manage centrally placed malignant tumors and local recurrence of lung cancer, respectively., Anecdotal reports suggest a role of EBUS in diagnosing and treating mediastinal bronchogenic cyst. In general, EBUS-TBNA is performed as a day-care procedure in the bronchoscopy suite, under conscious sedation (with the subject breathing spontaneously) or under general anesthesia. The lymph node stations that are accessible by EBUS-TBNA include stations 2R/L, 3P, 4R/L, 7 10R/L, and 11R/L. At our center, we perform EBUS-TBNA under conscious sedation using intravenous midazolam and fentanyl. After an overnight fast, subjects are administered intramuscular atropine (0.6 mg) and promethazine (25 mg), 15 min before the procedure. Topical lignocaine (10%) is sprayed over the oropharynx, and lignocaine solution (2 mL aliquots of 1% lignocaine) is instilled bronchoscopically over the vocal cords and airways. The EBUS scope is then introduced through the oral cavity. After a quick inspection of the airway, the mediastinal and hilar nodes are visualized using EBUS. The use of the Doppler imaging helps in identifying vascular structures, adding to the safety of the TBNA procedure. The size of the lymph node is measured and the endosonographic characteristics are noted., Subsequently, the needle along with its sheath is suitably positioned, and under real-time ultrasound guidance the node is punctured. An internal stylet provided with the needle serves to clear the bronchial cartilage, which could enter the needle during penetration of the airway. Following this step, the needle is moved back and forth (usually 10–20 “revolutions”) within the node, under real-time ultrasound guidance. The EBUS-TBNA needle comes with a 20 mL vacuum (VacLok™) syringe, which is attached to the needle while performing fine-needle aspiration (FNA). The entire procedure is repeated (number of passes in each node) till sufficient material is available for various investigations (including samples for microbiology and flow cytometry). In general, we obtain two or three passes from each enlarged lymph node. The mediastinal lymph nodes can also be accessed with an echoendoscope introduced into the esophagus. Once the scope is in the esophagus, ultrasonography is used to identify various landmarks and lymph node stations. Puncturing the node and obtaining the sample are performed, as described above. Initially, this procedure was described using a dedicated endoscopic ultrasound (EUS) by gastroenterologists. Alternatively, the same EBUS scope can also be introduced in to the esophagus to perform “EUS with echobronchoscope-guided FNA” (EUS-B-FNA). The lymph nodes that can be sampled using EUS-B-FNA include lymph node stations 4L (left paratracheal), 7 (subcarinal), 8 (paraesophageal), and 9 (pulmonary ligament). A combination of EBUS-TBNA and EUS-FNA (or EUS-B-FNA), referred to as complete “medical mediastinoscopy” is considered superior to either procedure alone and is an useful alternative to mediastinoscopy., EUS-B-FNA is also useful in patients where excessive cough, hypoxemia, or other factors preclude EBUS-TBNA. In fact, we have successfully used EUS-B-FNA in an endotracheally intubated and critically ill patient, where EBUS-TBNA was considered risky. How are the samples processed? Staging of lung cancer: The slides of aspirate from each lymph node station is labeled separately. The highest nodal station is sampled first, i.e., N3 followed by N2 and then N1. This prevents falsely upstaging the tumor. After each lymph node station, the needle is flushed with saline to minimize false positivity due to prior sampling. We obtain at least three passes from all accessible lymph nodes which are ≥6 mm. In addition, we use 10% buffered formalin for preparing cell blocks to enable further molecular testing. Granulomatous lymphadenitis: In subjects suspected to have tuberculosis, we typically obtain three passes from each node, while in sarcoidosis, we obtain a total of at least six passes (two passes from three lymph nodes or three from two lymph nodes, in case only two enlarged nodes are accessible)., While we obtain cell blocks in all those with suspected granulomatous lymphadenitis, they are examined only if no diagnosis is possible on slides. Lymphoma: Three passes are obtained from each lymph node identified on EBUS. Apart from the routine processing mentioned above, we ensure that the samples are available for flow cytometric analysis (RPMI solution) and cell block preparations. Diagnosis and subtyping of lymphoma poses a challenge, however EBUS-TBNA has been shown to be a useful diagnostic modality., The use of flow cytometry enables establishment of lymphocyte monoclonality, which might not be possible with cytomorphology alone. Two dedicated passes are usually considered sufficient for flow cytometry. What are the challenges with EBUS-TBNA? EBUS-TBNA has been widely adopted across the globe. Though available in larger cities, this newer diagnostic modality is not yet universally available across India. In a recent survey of bronchoscopy practices conducted among 669 respiratory physicians throughout India, only 27% were performing EBUS-TBNA. On the contrary, 74% of the respondents were using conventional TBNA in their practice. Although EBUS-TBNA is cost effective and safer than the more invasive surgical procedures (such as mediastinoscopy or VATS), it still incurs considerable expense. A significant proportion of patients visiting our bronchoscopy suite are economically disadvantaged, and cannot afford a EBUS-TBNA needle. The situation is likely to be same throughout our country, though data are lacking. Besides, even where EBUS-TBNA is available, the facilities for ROSE are not available uniformly. The reasons for this include, a deficiency of the required infrastructure, the additional cost, and the availability of a skilled cytologist on-site. As with other interventional procedures, the safety and diagnostic yield of EBUS-TBNA depends on the skills and expertise of the operator, which in turn requires adequate training. Consensus based on expert opinion suggested that at least 40 EBUS-TBNA should be performed for becoming proficient in the procedure. A recent meta-analysis concluded that performing at least 37–44 procedures is essential to overcome the initial learning curve. Also, training on a simulator was shown to be as good as the traditional apprenticeship-based training. Lack of formal training opportunities and sufficient experience could be a major factor why only 27% of our bronchoscopists were performing EBUS-TBNA. In fact, nearly half of the respiratory physicians acquired their bronchoscopy skills after completing their fellowship, indicating the lacuna in the current training. ROSE has the potential to improve diagnostic performance by ensuring adequacy of the specimens and providing feedback to the operator before concluding the procedure. However, the existing literature is equivocal and does not suggest a clear benefit of using ROSE to improve the diagnostic performance of EBUS-TBNA or shorten the procedure duration. In resource-limited settings where ROSE is not feasible, training of respiratory physicians and implementing telecytology is an attractive option. Several questions still remain unanswered, such as the optimal number of nodes and the optimal number of passes in each node to improve the sensitivity of EBUS-TBNA. While it is true that a positive result obtained by EBUS-TBNA may obviate the need for a more invasive procedure such as mediastinoscopy or VATS, the diagnostic sensitivity of EBUS-TBNA is generally low. The sensitivity of EBUS-TBNA at our center, and the AQuIRE (American College of Chest Physicians Quality Improvement Registry, Education, and Evaluation Registry) were only 61.2% (of the total 972 participants) and 51.3% (n = 1299), respectively., Also, the sensitivity may be even lower, when performed outside academic centers. Liquid-based cytology preparations when available, can improve the diagnostic sensitivity of EBUS-TBNA as compared to conventional smears (82.1% vs. 56% in one study). Further, the diagnostic performance may be different in different settings. For example, the pooled sensitivity of EBUS-TBNA in mediastinal restaging following neo-adjuvant chemotherapy (67%) is lower than that of initial mediastinal staging in treatment-naïve lung cancer (88%)., Thus, in general, a negative EBUS-TBNA requires either confirmation by a second procedure or close follow up. In summary, the introduction of EBUS-TBNA in clinical practice has revolutionized the management of intrathoracic lymphadenopathy. EBUS-TBNA has replaced mediastinoscopy as the initial procedure in the staging of lung cancer and is currently the preferred modality for the investigation of intrathoracic lymphadenopathy. Several challenges need to be addressed to improve the yield of EBUS-TBNA, especially in the era of personalized medicine where the need for tissue is greater than ever before. The feedback which the cytologist provides to the clinician is vital to improve the overall diagnostic performance of EBUS-TBNA. Hoffmann H. Invasive staging of lung cancer by mediastinoscopy and video-assisted thoracoscopy. Lung Cancer 2001;34(Suppl 3):S3-5. Zielinski M. Video-assisted mediastinoscopic lymphadenectomy and transcervical extended mediastinal lymphadenectomy. Thorac Surg Clin 2012;22:219-25. Avritscher R, Krishnamurthy S, Ensor J, Gupta S, Tam A, Madoff DC, et al. Accuracy and sensitivity of computed tomography-guided percutaneous needle biopsy of pulmonary hilar lymph nodes. Cancer 2010;116:1974-80. Holty JE, Kuschner WG, Gould MK. Accuracy of transbronchial needle aspiration for mediastinal staging of non-small cell lung cancer: A meta-analysis. Thorax 2005;60:949-55. Khan A, Agarwal R, Aggarwal AN, Gupta N, Bal A, Singh N, et al. Blind transbronchial needle aspiration without an on-site cytopathologist: Experience of 473 procedures. Natl Med J India 2011;24:136-9. Haponik EF, Shure D. Underutilization of transbronchial needle aspiration: Experiences of current pulmonary fellows. Chest 1997;112:251-3. Muthu V, Sehgal IS, Dhooria S, Aggarwal AN, Agarwal R. Efficacy of endosonographic procedures in mediastinal restaging of lung cancer after neoadjuvant therapy: A systematic review and diagnostic accuracy meta-analysis. Chest 2018;154:99-109. Sehgal IS, Dhooria S, Aggarwal AN, Behera D, Agarwal R. Endosonography versus mediastinoscopy in mediastinal staging of lung cancer: Systematic review and meta-analysis. Ann Thorac Surg 2016;102:1747-55. Silvestri GA, Gonzalez AV, Jantz MA, Margolis ML, Gould MK, Tanoue LT, et al. Methods for staging non-small cell lung cancer: Diagnosis and management of lung cancer, 3rd ed: American College of Chest Physicians evidence-based clinical practice guidelines. Chest 2013;143:e211S-50S. Dhooria S, Sehgal IS, Gupta N, Aggarwal AN, Behera D, Agarwal R. Diagnostic yield and complications of EBUS-TBNA performed under bronchoscopist-directed conscious sedation: Single center experience of 1004 subjects. J Bronchology Interv Pulmonol 2017;24:7-14. McCracken DJ, Bailey M, McDermott MT, McManus TE. A retrospective analysis comparing the use of ProCore(R) with standard fine needle aspiration in endobronchial ultrasound-guided transbronchial needle aspiration (EBUS-TBNA). Ir J Med Sci 2018. doi: 10.1007/s11845-018-1816-z. Tyan C, Patel P, Czarnecka K, Gompelmann D, Eberhardt R, Fortin M, et al. Flexible 19-Gauge endobronchial ultrasound-guided transbronchial needle aspiration needle:First experience. Respiration 2017;94:52-7. Tyan CC, Machuca T, Czarnecka K, Ko HM, da Cunha Santos G, Boerner SL, et al. Performance of endobronchial ultrasound-guided transbronchial needle aspiration for the diagnosis of isolated mediastinal and hilar lymphadenopathy. Respiration 2017;94:457-64. Crombag LM, Annema JT. Left adrenal gland analysis in lung cancer patients using the endobronchial ultrasound scope: A feasibility trial. Respiration 2016;91:235-40. Erer OF, Cimen P, Unlu M, Katgi N. Four cases of pulmonary thromboembolism diagnosed by endobronchial ultrasound. J Clin Ultrasound 2017;45:441-4. Goyal R, Chachra V, Gogia P. Diagnosis of pulmonary embolism by endobronchial ultrasound. Lung India 2015;32:606-8. Harris K, Oakley E, Bellnier D, Sha firstein G. Endobronchial ultrasound-guidance for interstitial photodynamic therapy of locally advanced lung cancer-a new interventional concept. J Thorac Dis 2017;9:2613-8. Mehta HJ, Jantz MA. Endobronchial ultrasound-guided intratumoral injection of cisplatin for the treatment of isolated mediastinal recurrence of lung cancer. J Vis Exp 2017. doi: 10.3791/54855. Maturu VN, Dhooria S, Agarwal R. Efficacy and safety of transbronchial needle aspiration in diagnosis and treatment of mediastinal bronchogenic cysts: Systematic review of case reports. J Bronchology Interv Pulmonol 2015;22:195-203. Dhooria S, Aggarwal AN, Gupta D, Behera D, Agarwal R. Utility and safety of endoscopic ultrasound with bronchoscope-guided fine-needle aspiration in mediastinal lymph node sampling: Systematic review and meta-analysis. Respir Care 2015;60:1040-50. Dhooria S, Madan K, Pattabhiraman V, Sehgal IS, Mehta R, Vishwanath G, et al. A multicenter study on the utility and safety of EBUS-TBNA and EUS-B-FNA in children. Pediatr Pulmonol 2016;51:1031-9. Lee HY, Kim J, Jo YS, Park YS. Bacterial pericarditis as a fatal complication after endobronchial ultrasound-guided transbronchial needle aspiration. Eur J Cardiothorac Surg 2015;48:630-2. Matsuoka K, Ito A, Murata Y, Sakane T, Watanabe R, Imanishi N, et al. Severe mediastinitis and pericarditis after transbronchial needle aspiration. Ann Thorac Surg 2015;100:1881-3. Rusch VW, Asamura H, Watanabe H, Giroux DJ, Rami-Porta R, Goldstraw P. The IASLC lung cancer staging project: A proposal for a new international lymph node map in the forthcoming seventh edition of the TNM classification for lung cancer. J Thorac Oncol 2009;4:568-77. Kaur H, Dhooria S, Aggarwal AN, Gupta D, Behera D, Agarwal R. A randomized trial of 1% vs 2% lignocaine by the Spray-as-You-Go technique for topical anesthesia during flexible bronchoscopy. Chest 2015;148:739-45. Dhooria S, Agarwal R, Aggarwal AN, Bal A, Gupta N, Gupta D. Differentiating tuberculosis from sarcoidosis by sonographic characteristics of lymph nodes on endobronchial ultrasonography: A study of 165 patients. J Thorac Cardiovasc Surg 2014;148:662-7. Dhooria S, Agarwal R, Aggarwal AN, Gupta N, Gupta D, Behera D. Agreement of mediastinal lymph node size between computed tomography and endobronchial ultrasonography: A study of 617 patients. Ann Thorac Surg 2015;99:1894-8. Dhooria S, Aggarwal AN, Singh N, Gupta D, Behera D, Gupta N, et al. Endoscopic ultrasound-guided fine-needle aspiration with an echobronchoscope in undiagnosed mediastinal lymphadenopathy:First experience from India. Lung India 2015;32:6-10. Vilmann P, Krasnik M, Larsen SS, Jacobsen GK, Clementsen P. Transesophageal endoscopic ultrasound-guided fine-needle aspiration (EUS-FNA) and endobronchial ultrasound-guided transbronchial needle aspiration (EBUS-TBNA) biopsy: A combined approach in the evaluation of mediastinal lesions. Endoscopy 2005;37:833-9. Prasad KT, Sehgal IS, Gupta N, Singh N, Agarwal R, Dhooria S. Endoscopic ultrasound (with an echobronchoscope)-guided fine-needle aspiration for diagnosis of a mediastinal lesion in a mechanically ventilated patient: A case report and systematic review of the literature. Indian J Crit Care Med 2016;20:608-12. Dhooria S, Gupta N, Bal A, Sehgal IS, Aggarwal AN, Sethi S, et al. Role of Xpert MTB/RIF in differentiating tuberculosis from sarcoidosis in patients with mediastinal lymphadenopathy undergoing EBUS-TBNA: A study of 147 patients. Sarcoidosis Vasc Diffuse Lung Dis 2016;33:258-66. Jin M, Wakely PE, Jr. Endoscopic/endobronchial ultrasound-guided fine needle aspiration and ancillary techniques, particularly flow cytometry, in diagnosing deep-seated lymphomas. Acta Cytol 2016;60:326-35. Dhooria S, Mehta R, Madan K, Vishwanath G, Sehgal IS, Chhajed PN, et al. A multicenter study on the utility of endobronchial ultrasound in the diagnosis of mediastinal lymphoma in a developing country. J Bronchology Interv Pulmonol 2018; DOI: 10.1097/LBR.0000000000000552. Nunez AL, Jhala NC, Carroll AJ, Mikhail FM, Reddy VV, Xian RR, et al. Endoscopic ultrasound and endobronchial ultrasound-guided fine-needle aspiration of deep-seated lymphadenopathy: Analysis of 1338 cases. Cytojournal 2012;9:14. Madan K, Mohan A, Agarwal R, Hadda V, Khilnani GC, Guleria R. A survey of flexible bronchoscopy practices in India: The Indian bronchoscopy survey (2017). Lung India 2018;35:98-107. Harewood GC, Pascual J, Raimondo M, Woodward T, Johnson M, McComb B, et al. Economic analysis of combined endoscopic and endobronchial ultrasound in the evaluation of patients with suspected non-small cell lung cancer. Lung Cancer 2010;67:366-71. Bolliger CT, Mathur PN, Beamis JF, Becker HD, Cavaliere S, Colt H, et al. ERS/ATS statement on interventional pulmonology. European Respiratory Society/American Thoracic Society. Eur Respir J 2002;19:356-73. Sehgal IS, Dhooria S, Aggarwal AN, Agarwal R. Training and proficiency in endobronchial ultrasound-guided transbronchial needle aspiration: A systematic review. Respirology 2017;22:1547-57. Nakajima T, Yasufuku K. The techniques of endobronchial ultrasound-guided transbronchial needle aspiration. Innovations (Phila) 2011;6:57-64. Muthu V, Gupta N, Dhooria S, Sehgal IS, Bal A, Aggarwal AN, et al. A prospective, randomized, double-blind trial comparing the diagnostic yield of 21- and 22-gauge aspiration needles for performing endobronchial ultrasound-guided transbronchial needle aspiration in sarcoidosis. Chest 2016;149:1111-3. Jeyabalan A, Shelley-Fraser G, Medford AR. Impact of needle gauge on characterization of endobronchial ultrasound-guided transbronchial needle aspiration (EBUS-TBNA) histology samples. Respirology 2014;19:735-9. Chaddha U, Ronaghi R, Elatre W, Chang CF, Mahdavi R. Comparison of sample adequacy and diagnostic yield of 19- and 22-G EBUS-TBNA needles. J Bronchology Interv Pulmonol 2018;25:264-8. Czarnecka-Kujawa K, Tremblay A, Yasufuku K, Sczaniecka A, Parthiban S, Kunz L, et al. A preclinical evaluation comparing the performance of a novel 19-G flexible needle to a commercially available 22-G EBUS-TBNA sampling needle. Respiration 2018;95:55-62. Xing J, Manos S, Monaco SE, Wilson DO, Pantanowitz L. Endobronchial ultrasound-guided transbronchial needle aspiration: A pilot study to evaluate the utility of the ProCore biopsy needle for lymph node sampling. Acta Cytol 2016;60:254-9. Dhooria S, Sehgal IS, Gupta N, Bal A, Prasad KT, Aggarwal AN, et al. A randomized trial evaluating the effect of 10 versus 20 revolutions inside the lymph node on the diagnostic yield of EBUS-TBNA in subjects with sarcoidosis. Respiration 2018;1-8. Xu Y, Lin J, Jin Y, Wu X, Zheng H, Feng J. Is endobronchial ultrasound-guided transbronchial needle aspiration with a stylet necessary for lymph node screening in lung cancer patients? Braz J Med Biol Res 2017;50:e6372. Scholten EL, Semaan R, Illei P, Mallow C, Arias S, Feller-Kopman D, et al. Stylet use does not improve diagnostic outcomes in endobronchial ultrasonographic transbronchial needle aspiration: A randomized clinical trial. Chest 2017;151:636-42. Sehgal IS, Dhooria S, Aggarwal AN, Agarwal R. Impact of rapid on-site cytological evaluation (ROSE) on the diagnostic yield of transbronchial needle aspiration during mediastinal lymph node sampling: Systematic review and meta-analysis. Chest 2018;153:929-38. Bott MJ, James B, Collins BT, Murray BA, Puri V, Kreisel D, et al. A prospective clinical trial of telecytopathology for rapid interpretation of specimens obtained during endobronchial ultrasound-fine needle aspiration. Ann Thorac Surg 2015;100:201-5; discussion 5-6. Wahidi MM, Herth F, Yasufuku K, Shepherd RW, Yarmus L, Chawla M, et al. Technical aspects of endobronchial ultrasound-guided transbronchial needle aspiration: CHEST guideline and expert panel report. Chest 2016;149:816-35. Yarmus LB, Akulian J, Lechtzin N, Yasin F, Kamdar B, Ernst A, et al. Comparison of 21-gauge and 22-gauge aspiration needle in endobronchial ultrasound-guided transbronchial needle aspiration: Results of the American College of Chest Physicians Quality Improvement Registry, Education, and Evaluation Registry. Chest 2013;143:1036-43. Qiu T, Zhu H, Cai M, Han Q, Shi J, Wang K. Liquid-based cytology preparation can improve cytological assessment of endobronchial ultrasound-guided transbronchial needle aspiration. Acta Cytol 2015;59:139-43. Adams K, Shah PL, Edmonds L, Lim E. Test performance of endobronchial ultrasound and transbronchial needle aspiration biopsy for mediastinal staging in patients with lung cancer: Systematic review and meta-analysis. Thorax 2009;64:757-62. Casadio C, Guarize J, Donghi S, Di Tonno C, Fumagalli C, Vacirca D, et al. Molecular testing for targeted therapy in advanced non-small cell lung cancer: Suitability of endobronchial ultrasound transbronchial needle aspiration. Am J Clin Pathol 2015;144:629-34. Labarca G, Folch E, Jantz M, Mehta HJ, Majid A, Fernandez-Bussy S. Adequacy of samples obtained by endobronchial ultrasound with transbronchial needle aspiration for molecular analysis in patients with non-small cell lung cancer. Systematic review and meta-analysis. Ann Am Thorac Soc 2018;15:1205-16. Sakata KK, Midthun DE, Mullon JJ, Kern RM, Nelson DR, Edell ES, et al. Comparison of programmed death ligand-1 immunohistochemical staining between endobronchial ultrasound transbronchial needle aspiration and resected lung cancer specimens. Chest 2018;154:827-37. Heymann JJ, Bulman WA, Swinarski D, Pagan CA, Crapanzano JP, Haghighi M, et al. PD-L1 expression in non-small cell lung carcinoma: Comparison among cytology, small biopsy, and surgical resection specimens. Cancer Cytopathol 2017;125:896-907. Sakakibara R, Inamura K, Tambo Y, Ninomiya H, Kitazono S, Yanagitani N, et al. EBUS-TBNA as a promising method for the evaluation of tumor PD-L1 expression in lung cancer. Clin Lung Cancer 2017;18:527-34.e1. Layfield LJ, Roy-Chowdhuri S, Baloch Z, Ehya H, Geisinger K, Hsiao SJ, et al. Utilization of ancillary studies in the cytologic diagnosis of respiratory lesions: The papanicolaou society of cytopathology consensus recommendations for respiratory cytology. Diagn Cytopathol 2016;44:1000-9. Alsharif M, Andrade RS, Groth SS, Stelow EB, Pambuccian SE. Endobronchial ultrasound-guided transbronchial fine-needle aspiration: The University of Minnesota experience, with emphasis on usefulness, adequacy assessment, and diagnostic difficulties. Am J Clin Pathol 2008;130:434-43.